Do you ever feel like you were dropped in the middle of an episode, or that you missed an episode? That’s how I felt going into this week’s Lucifer. I had absolutely no idea what was going on. That is not to say it wasn’t a fascinating and wonderful character building episode for our very own Chloe Decker — but a little lead up next time would be nice! Anyway, “My Little Monkey” explores Chloe’s father’s murder. It begins with a flashback, where Chloe’s father is at a convenience store talking about how proud he is of his daughter. A man in a hoodie holds both the clerk and her father and gunpoint before the gunman guns Officer Decker down. We then see, in the present day, that Chloe’s father’s murderer is being released on family leave in order to attend his granddaughter’s christening. Chloe is beyond livid. Chloe goes to the jailhouse to witness the man’s release and follows the transport vehicle — which is obviously a great idea. However, when she catches up with the van — plot twist! — everyone inside is dead. Chloe then decides that she is too close to the matter and removes herself from the case. Dan then steps up to the plate with Lucifer by his side. Lucifer is currently having an identity crisis of his own and wants to learn from Dan. This is likely because Linda is currently ignoring Lucifer’s calls — you know, she’s still getting over the whole him being the devil thing. Honestly if my BFF was the devil, I’d probably give them a high five and move on, but to each their own. Lucifer decides that to not be himself, he should be more like Detective Douche. So how did their dynamic go exactly? Well, Lucifer saying, “I need to learn how to douche” and “you’re like duct tape or a favorite socket wrench. I want you to teach me how to be a tool” kind of gives you an idea. Back at Chloe’s apartment, Maze is trying to find the right career path now that she is on her own. The struggle is real. However, the action really gets going when Maze leaves and Tina Fields — the daughter of the Chloe’s dad’s murderer — holds her at gunpoint. But thanks to Trixie, the situation is quickly defused. Tina shows Chloe a video of Joe, the murderer, that proves he wasn’t actually the one who shot her father. Once Chloe, Dan, and Lucifer figure out that Joe traded a false confession for regular payments to his daughter, the detectives go find another lead. We learn that Chloe’s father was working a case and got on the wrong person’s radar. Turns out that the prison warden was the actual culprit. However, when the group goes after the warden, he escapes. Luckily, Maze tracks him down in the funniest moment of the episode. Soon the warden is tied and gagged by Maze is under the scrutiny Luci, Maze, and Chloe. Chloe pulls her gun on her father’s murderer, but chooses to let him rot in the prison he used to run. That should be fun. 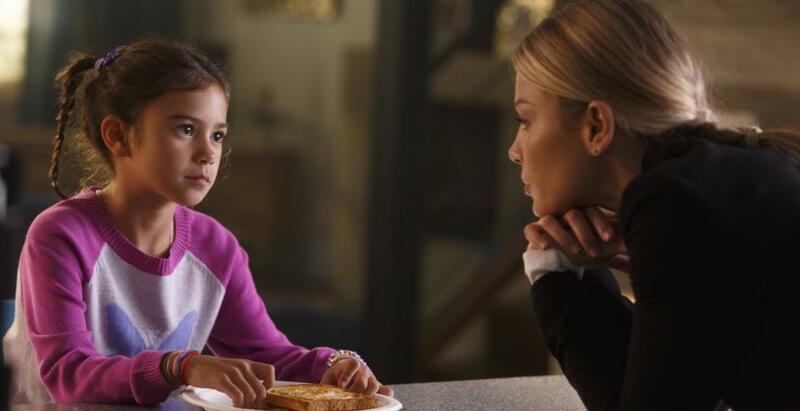 Once the case is closed the BEST PART OF THE ENTIRE EPISODE HAPPENS: Lucifer tells Chloe that although he does not have a good relationship with his father, he thinks her father would be proud of her. Then with tears in her eyes, Chloe hugs Lucifer in the most touching moment ever. MY LUCIFER/CHLOE SHIPPING HEART IS SO HAPPY IT COULD DIEEEEEEE! Baby Decker meeting Baby Douche was hilarious. I may hate Detective Douche, but that entire seen was heartwarming. It was so nice not having Amenadiel this episode. Linda and Maze reconciling and being BFFs again is also the best thing ever. Although, it did feel weird seeing Maze so vulnerable. It seems kind of out of character for a torcher demon. I mean, Lucifer is barely in touch with his emotions. I am so here for Maze being an LAPD bounty hunter!